After a sort of slow opening act, Steven Soderbergh’s Logan Lucky becomes a sweet, funny, raucous, touching and unexpected film, the most enjoyable thing he’s made after a series of dead serious dramas. Kind of like Ocean’s Eleven for the Monster Truck crowd, this is popcorn fare with brains, but it’s not afraid to get loopy and mess around in the sandbox either in terms of comedy and characterization, especially that of Daniel Craig’s Joe Bang, the world’s most aloof safecracker. Joe’s help is needed when brothers Jimmy (Channing Tatum) and Clyde (Adam Driver) Logan take it upon themselves to stage a heist during NASCAR mania when times of financial woe befall them. Jimmy is laid back and affable, Clyde is old school idiosyncratic to the point of hysterics and their dynamic is something hilarious. Throw in Joe with a Bang and the thing takes off, once the gears of the plot start grinding, mind you. Like I said, the opening dilly dallys a tad. Despite being a screwball comedy of sorts, this never goes too far off the rails into, say, Cannonball Run territory and never feels *too* light or inconsequential. Soderbergh is an alchemist in complete control of every element and this thing unfolds deliberately, intricately and always playfully. Surrounding them is a delightfully eclectic supporting cast including Seth McFarlane, Riley Keogh, Katie Holmes, Jack Quaid, Brian Gleeson, Katherine Waterson, Macon Blair, Sebastian Stan and Dwight Yoakam as a breezy Prison Warden. The heist is a blast, full of screw ups, diversions and delirious suspense as these ill prepared, lovably hapless goofs try to do right by their families and each other. Craig must be broken out of jail where he’s “in-car-cer-ated” for the duration of the job and then stealthily returned once the mission is accomplished, and Jimmy has to be done with it all in time for a beauty pageant that his daughter (Farrah Mackenzie, wonderful) is appearing in. It’s fairly random but it just somehow works, from left field character choices to specifically nutty set pieces to third act twists that come out of nowhere. Just when you think you can relax, a federal agent (Hilary Swank in full shark mode) shows up to stir the pot again. The film ends on a narrative cliffhanger and with perhaps one of the best and most enticing zoom-out shots I’ve ever seen that had me both wishing for a sequel and wanting the magic to remain bottled just there at that perfect penultimate moment. Great film. Sometime an artists whose primary output is writing tries their hand at directing, with mixed results. In the case of Stephen Gaghan’s Abandon, the results are flat out miserable, all across the board when you consider that he wrote the thing too. Katie Holmes headlines the murky tale of a girl whose mysterious ex boyfriend (Charlie Hunnam) resurfaces to creep her out after disappearing years before. The film is steeped in darkly shot, choking scenes of mumbling gloom that I suppose were an attempt at atmosphere but just cloud perceptions and numb over any chance of tension or thrills. Holmes has always been a huge talent and she does her best here but you can only do so much with material this bad. Benjamin Bratt plays a hunky detective who gets a bit too involved in her case than he probably should, and ends up standing around looking confused most of the time. Hunnam, whose acting style has always irked me, tries to do the deep dark brooding bad boy thing here, and comes across as listless and bored, his motivations never made clear beyond lurking with vague intent. Just as an example of how humdrum it all is: Fred Ward plays Bratt’s superior officer and when he’s introduced in a dimly lit precinct, he’s literally just sitting on the floor against his desk, looking like he gave up with the script, tossed it in the dustbin and is waiting for them to yell cut so he can call his agent and finally get the next Remo Williams film underway instead of appearing in gothic Hallmark trash like this. It’s interesting because Gaghan showed great promise after this by directing the phenomenal Syriana, then subsequently waded back into the mires of mediocrity with his next feature, Gold. He’s uneven as a director, and this is the lowest point for him. The whole thing fits the title, really; it’s like they Abandoned any hope of making this half decent and just cloaked it in as much hollow, portentous energy they could muster up and hoped no one would notice that there’s no substance to back up the style. The ending is as empty as the rest of it, there’s no resolution, twist or aha moment, it just ends in thin air. Avoid. a taut, entertaining and oh so slightly heavy handed single location thriller that brings home the bacon, albeit messily spilling some grease along the way. Farrell is a hotshot businessman who steps into a phone booth (remember those?) one day, which serendipitously happens to also be the favourite haunt for sniper slinging whackjob Sutherland, who plays sadistic mind games, extorts the poor guy and digs up his darkest secrets, all while keeping him firmly in the crosshairs of his high powered rifle. The cops, led by a stoic Forest Whitaker, are perplexed at first and eventually drawn into this monster’s web too, as Farrell’s life begins to unravel at the whims of this unseen harasser, and the audience gets to see just how far either will go to resolve or escalate the situation. In this day and age there’d never be a scenario like this, the obvious reason being the extinction of phone-booths, but in the era of social media tech giants there’s just too much information and reaction time available for a situation this intimate to play out to the end. These days this nightmare would take the form of account hacking, an equally terrifying prospect, but a far less lucrative idea for a film. Now, we never really see Sutherland but for a few bleary frames, and he probably just recorded his dialogue from a cushy studio in jammies plastered with the 24 logo, but none of that takes away any of the lupine, icy calm malevolence from his vocal work here, and we believe in the ability of this man to freeze someone in their tracks, not only with a gun but with the power of verbal intonation as well. 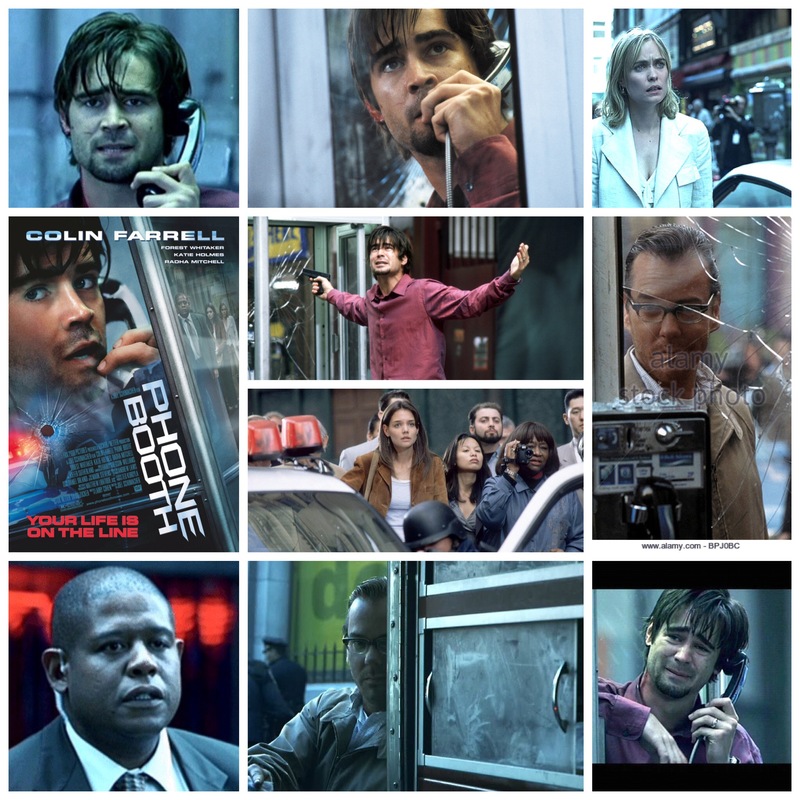 Farrell uses atypical caged animal intensity to ramp up the tension, and the other players, including Rhada Mitchell as his wife, Jared Leto and a very young looking Katie Holmes do fine by their roles. It’s a little glossy, a little too Hollywood if you know what I mean, but it’s a well oiled thriller nonetheless, with Sutherland’s shrouded, edgy persona being the highlight. Everyone knows that high school teenagers are the most lawless, degenerate, ill adjusted scoundrels out there, but what to do about it? Radically unethical, mandatory brain modification of course, or at least that’s what mad scientist school principal Bruce Greenwood has in mind in Disturbing Behaviour, a Scream/Faculty esque 90’s shocker that didn’t get half the attention it deserved upon release. Shame because it’s a sleek, well oiled little horror outing. James Marsden and Katie Holmes are the new kids in town, siblings thrust into the savage Serengeti of high school and forced to jump through that fiery hoop of social interaction. 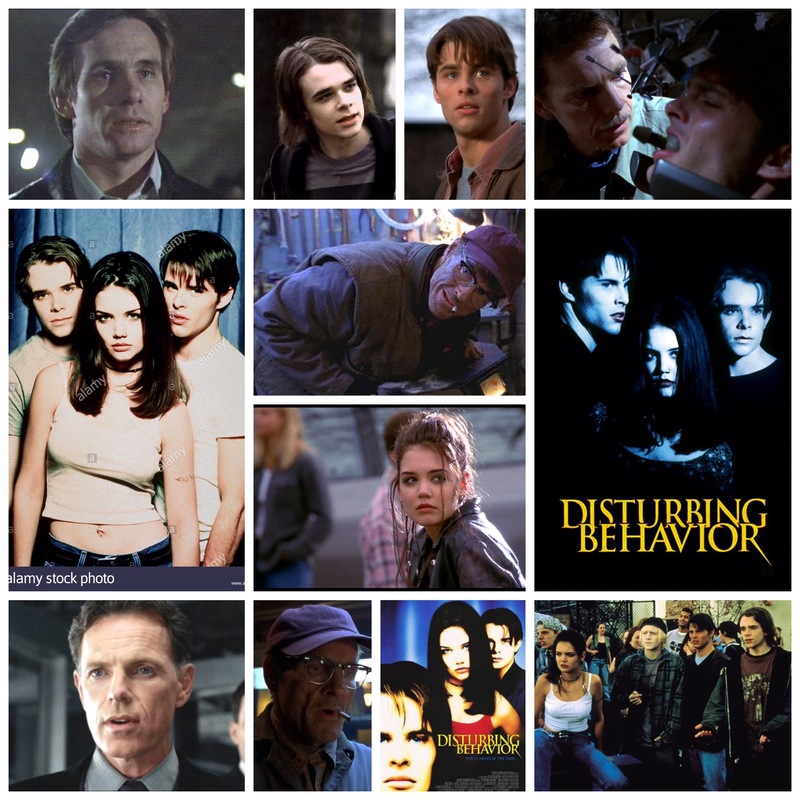 Nick Stahl channels his inner awkwardness as the brooding outcast who befriends them, and the trio soon notice some weird activity from their peers. Behavioural patterns are erratic, robotic and vicious, their classmates seemingly not themselves anymore. A creepy local cop (always nice to see Steve Railsback) seems to know what’s up but eerily keeps it hush hush, and calmly maniacal Greenwood definitely has a few skeletons in a few closets. It’s up to them to figure out what’s going on, escape the cerebral rescanning net before they end up dead or worse. Assisting them is a scene stealing, nearly unrecognizable William Sadler as the school’s eccentric, hard-nosed janitor. Working from a script by word wizard Scott Rosenberg and beautifully spooky cinematography from John Bartley that captures the unsettling North Vancouver and Bowen Island coastlines, this flick has a lot going for it and should have gotten way more kudos. Anyone who loves a good slice of southern gothic murder mystery should check out Sam Raimi’s The Gift, one of several films in the eclectic scoundrel’s ouvre which made a departure from his usual brand of chaotic horror. Cate Blanchett stars as Annabelle, a single mother with a very perceptive telepathic ability, which in rural USA is greeted without any skepticism by the locals. She is renowned for her gift, and often approached by people in need. The story sees her trying to locate young Jessica (Katie Holmes), who has gone missing, and discovering some nasty secrets about the people around her in the process, people she thought she knew better. Jessica’s fiance (Greg Kinnear) is desperate but clearly knows something he’s not saying. Also involved is battered housewife Valerie (Hilary Swank), her terrifying abusive boyfriend Donnie (Keanu Reeves), a local mechanic (Giovanni Ribisi) who befriends Annabelle, and others. It’s an ugly tale contrasted by Blanchett’s striking beauty, which the cameras capture in all the right instances. She could be rearranging a bookshelf and still be compelling and elegant, and always is in whichever role she takes on. Reeves is a scary tornado of pent up rage and sickness, cast way against type and loving every rage fuelled second. As if the main cast wasn’t packed enough with talent, we also get stellar work from Gary Cole, Michael Jeter, Kim Dickens, Rosemary Harris, a random cameo from Danny Elfman and a sly turn from J.K. Simmons as the county sheriff. What a cast, eh? Raimi puts them to good use, and each one gets their moment to shine. I’ve never seen a film by the director I haven’t loved; the guy just makes super fun, accessible genre treats that are irresistibly likable. Pair that with the evocative southern tone and Blanchett’s winning presence and you’ve got one hell of a little package. Very overlooked stuff.